Toward the end of our conversation, Madelaine’s teacher noted that it is difficult to know what resources to use, or who to ask for advice on Internet safety. 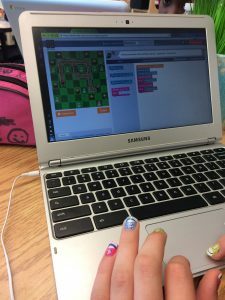 Her comments made me wonder whether other teachers feel this way, so I decided to use my post this week to share research that can help teachers and parents to minimize risks, while also preparing kids to be smarter, savvier, and safer on the Internet. In my conversation with Madelaine, I emphasized the importance of parents, teachers and kids talking openly about what safety means, the kinds of sites or activities that might pose a risk, how to avoid risks, and what to do if they find themselves in a situation that makes them feel upset. In a landmark study published in 2011, Sonia Livingstone, Leslie Haddon, Anke Görzig, Kjartan Ólafsson and members of the EU Kids Online network found that 12 % of kids had experienced situations online that made them feel bothered, or uncomfortable. Interestingly, a much higher percentage — 55% — agreed that there are things on the Internet that would upset other kids their age. So even if children haven’t experienced risky activities themselves, the majority seemed aware that sexually explicit images, mean comments from other people, or hateful user-generated content were indeed part of what they could encounter or experience online. At the same time, the study found that although more Internet use predicted higher probability of exposure to online risks, students who used the Internet more and for more diverse purposes at school and at home also seemed to acquire a more diverse set of digital skills that allowed them to take advantage of online opportunities. Plus, in another analysis, Sonck, Livingstone, Kuiper and de Haan found that digital skills may actually protect students from risks, even as they continue to be more active online. So, teaching digital literacies skills like how to block unwanted messages, delete browser history, and find information online may mitigate risks and their impact. In a third study of parenting strategies that mitigate online risks while maximizing opportunities, Livingstone and her colleagues found that there is no single best approach. However, it seems that a constellation of parenting strategies called “enabling mediation strategies” may strike the best balance of empowering kids to develop Internet skills while also minimizing the chances they’ll get into trouble. When parents encourage their children to explore the Internet to learn things, participate in online activities with their kids, invite their children into conversations about the Internet, explain how businesses try to sell things on the Internet, explain why some websites are appropriate or inappropriate, suggest ways to use the Internet safely, listen, and help their children when they ask how to solve problems online, and talk about good strategies for solving problems independently while also keeping tabs on their child’s online activities, it seems that kids develop skills that can make them resilient in the face of adversity. Parents who only restrict their children’s online activities protect them from risk — but their children may also lose out on opportunities to build digital skills. Interestingly, parents who report more advanced digital skills themselves are more likely to use enabling mediation strategies — so one important way for schools to support children may, in fact, be to support parents in their development of digital skills too. In a thank you letter, Madelaine wrote that her favourite fact was, “how we need to empower kids so that they have choices.” As teachers, we can create learning spaces that empower student choice and scaffold foundational online safety skills by creating opportunities to practice a range of skills, and by inviting conversation about what to do when things go wrong.